Priced From: $15.00, per person. $20 in July-August. 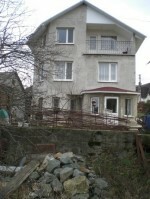 120 m2 two-storey country house of two bedrooms, dining room, full kitchen and bathroom. Priced From: $60. Highest: $150. Built in Mediterranean architectural style, this charming, immaculate small hotel is conveniently located in the central park area of Yalta, yet in a quiet location. 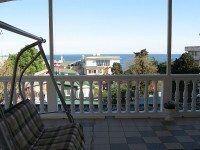 It is only a 10 minute walk to the beach and Yalta's Seaside Promenade. Rooms are good sized, clean, tastefully desecrated and appointed to the highest standard. The high ceiling gives an airy and spacious feel. Private balconies overlook the backyard and garden. The hotel boasts a large, well-maintained, fenced outdoor area with a swimming pool and beautiful garden. 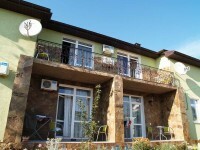 A luxury, 4-bedroom self-catering apartment situated in the central area of Feodosiya, near the historic center! All the major attractions of the city are within a walking distance. A 10-15 minute walk to the sea. The apartment occupies two levels and meets the highest Western standards. 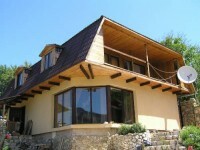 There are four bedrooms, a spacious airy lounge, three bathrooms, full well-equipped kitchen. All the rooms are air conditioned. 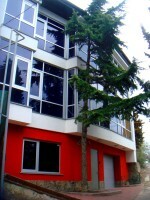 Cable TV, broadband Internet, electric domestic appliances. 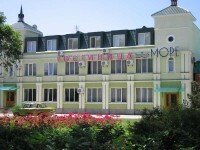 This hotel is ideal for those who would like to experience a Crimean seaside holiday. It is located 300 meters to the beaches with gold fine sand, that are actually the best ones in the whole Crimea. 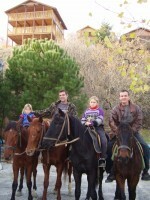 It's a perfect option for a family holiday, with children. There is a number of recreation facilities nearby. A walking distance to the Festival "Republic of Kazantip" held in August. 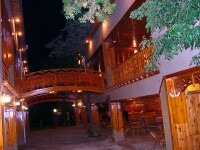 The hotel offers rooms and suites of different configuration. You can choose between standard rooms, 2- and 3-room suites, with ensuite bathrooms. The cottages offer cheaper, hostel-style accommodation. It's really unlikely that you will find anything cheaper than that in Popovka during the Kazantip Festival. Priced From: $30, half board. Svelna Vacation Cottages offer affordable, comfortable, safe, quiet and friendly accommodation at seaside. The cottages are located 350 meters away from the beaches, away from the hustle and bustle of city life. Six one-storey cottages. Bedrooms are furnished, with 2-4 twin beds. Fully fenced area with a big garden and outdoor recreational facilities. Two homemade meals a day are included in the price. A great value for budget conscious travelers coming to Crimea. 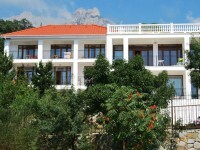 The Holiday House is located on the outskirts of the vacation resort of Koktebel. 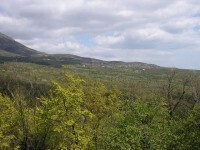 It offers stunning view of the Kara-Dag natural reserve. The beaches of the Koktebel Bay are only a 20-25 minute walk. This is an ideal getaway for both hiking lovers as well as for those looking for seaside vacation rentals at budget prices. If you are keen on hiking and mountaineering, singing by the campfire and an active holiday, Ghosts' Valley Estate is the most suitable place to stay. It attracts the tourists by the fresh and healthy air, quiet and peaceful surroundings, beautiful mountain landscapes and magnificent rocks. Welcome to my holiday apartment located in the resort town of Gurzuf, on the southern coast of Crimea,15 km northeast of Yalta. A luxurious, tastefully decorated in the unique Crimean Tatar style hotel is located right on the embankment of Sudak, at the foot of the famous medieval Genoese fortress. The hotel overlooks the beach and has an astonishing sea view. This property is of the highest standard and can satisfy the pickiest guest. 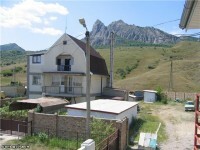 A two-storey villa at the foot of the Crimean mountain. Fireplace. Russian steam bath. Swimming pool. A beautiful view down the valley. 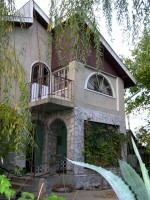 A modern, luxury 4-storey house situated right in the centre of Yalta, near the sea-front. This gorgeous house has four bedrooms with a total of 7 sleeping places, modern furniture, WiFi Internet. There is an open terrace with a stunning sea-view. 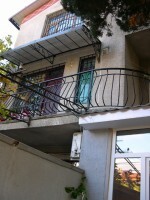 The guesthouse is located in the very center of Yalta, next to "Oreanda" Hotel, yet in a safe and quiet neighborhood. It is within a 5-10 minute walk to the beaches, leisure area, cafes and restaurants, entertainment. 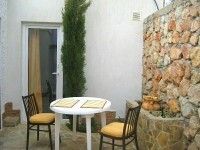 The guesthouse is composed of four self-catering apartments. Each has 2 or 3 bedrooms, an en-suite bathroom, well-equipped kitchen with dinning area, terrace, air-conditioning, cable TV. All the apartments have been fitted to a high standard and tastefully furnished. Priced From: $50. Highest: $85, per bedroom. The house is located just 30 meters away from the beaches with crystal waters, fine golden sand and shallow sea. The brand-new 3-storey house, built in 2008 consists of 15 single-room units offering remarkable sea views. All units are fully equipped and furnished, have refrigerators, satellite TV, ensuite bathrooms and private balconies. 24 hour hot & cold water supply. Quiet and safe neighborhood. A number of recreation facilities nearby. We welcome guests to our villa set in one of the most beautiful areas of Crimea, the seaside resort town of Miskhor, 17 km east of Yalta. The property meets the highest European standards and offers an astonishing sea view. Individually decorated rooms and suites with air-conditioning. Attractions nearby: a well-maintained beach, large park, a good choice of restaurants and bars, the Vorontsovsky Palace, Swallow's Nest Castle, Nikita Botanical Garden, Lyvadia Palace, cable road to the Ai-Petri mountain, Ukraine's oldest winery Massandra and many more. This is a lovely petite hotel in a perfect location, less than a 5 minute stroll from the famed Swallow’s Nest Castle and 7 minutes from the beach. The hotel comprises an elegant boutique style and meets the highest quality standards in the hospitality industry, thus exceeding guest expectations. There is no compromise in comfort and luxury! 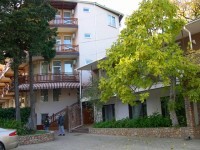 This brand new hotel is situated in the very center of Kerch, right at the embankment, steps to the sea, in a small park. All the attractions of the city are nearby. If you are looking for charm and luxury, don't miss the Svetlana Villa located 300 m from the beach in Popovka, Western Crimea. Popovka is known with its lovely sandy beaches and the Kazantip Festival held here in August. Our brand new villa opened its door in 2012. It is a boutique property with only 10 rooms and one detached 2 bedroom cottage. All rooms are modern, tastefully decorated and luxuriously outfitted. Amenities include: Western style bathroom, air-conditioning, satellite, WiFi, fridge, terrace or private patio. A unique, spacious, sunny apartment located in a historical building, in the very heart of Alupka, just steps away from the famous Vorontsovsky Palace! A 5 minute walk to the sea through the wonderful, gorgeous park. The apartment gives a feel of a palace room with 4-meter high ceilings. The space of the room is 50 sq.m. The windows overlook the sea and park. A magnificent view of the sea! The amenities include: two big glazed balconies, a fireplace, air-conditioning, full kitchen, two WCs, bathroom, shower cubicle. Come to the Ghosts' Valley for a most enjoyable vacation! Priced From: $45 per room. Location: the resort town of Zaozernoye, a 10 minute drive from Evpatoria. It is a nice beach getaway particularly for those looking for a smaller, quiet resort to stay with a family near crystal clean shallow sea and gold sandy beaches. The guesthouse offers well-appointed rooms with ensuite bathrooms, TV and air-conditioning. Meals are available at the cafe on site.